When the party season is just around the corner, you will love the sparkle it adds around your face and how they move with your every move... These wonderfully slender crystal Baguettes have a cascading effect, which give a youthful appearance! 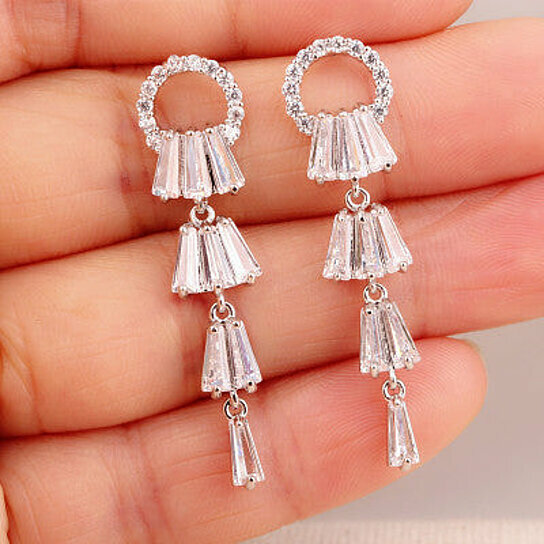 Get Kayli... your fashionably sophisticated and classic chandelier earrings, you will be happy you made a good choice! These delicate chandelier earrings are made of Yellow Gold plating and White Gold plating with sparkly crystal Baguettes inlay. The cascading effect makes them youthful. It measures 2.5 inches Long. They come in Gold and Silver. Great for gift giving this holiday season.